Succession management, often little more than an annual form-filling chore and a throwback to 'chess board' charting of 1950s multinationals, needs revitalisation to become a key driver of organisational renewal in the twenty-first century. Whilst recent corporate failings have focused attention on the difficulties of leadership succession, those organisations which have made the transition to greatness have understood the impact of strategic resourcing in renewing their leadership capability and character. The challenge for organisations is reconciling leadership demand and supply. When it may be impossible to say what your organisation will look like in three years time, or what strategy it will be pursuing, demand becomes difficult to predict. And in an era of shifting career realities, supply management needs to be more than an analysis of the age profile of the leadership population. Practical Succession Management is a response to the increasing relevance of proactive succession management but the widespread difficulty of making it happen. The author focuses on the business realities of succession management rather than provide a conceptualisation of how it might work in principle or simply headline a series of corporate 'just so' stories. 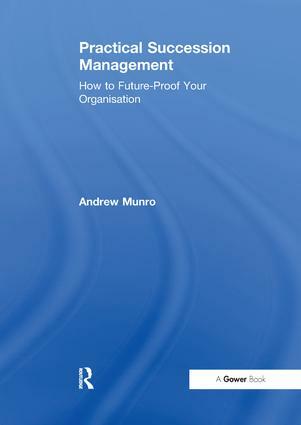 In a robust evaluation of relevant research and imaginative practice, Andrew Munro maps out the battlegrounds for succession management, with tools and techniques to guide readers from start to finish. The result is a book that will stimulate and challenge your thinking in opening up new options and provide practical methodologies to advance strategic resourcing within your organisation. Contents: List of figures; Preface; An overview of succession management. Part I The Context for Succession Management: The business imperative; The battle-grounds for succession; Rethinking leadership progression. Part II Formulating a Succession Game-plan: Managing the appointments process: who gets which job? ; Identifying business risk: how resilient is the organisation? ; Creating a talent blueprint; Strengthening the leadership pipeline: identifying and developing talent. Part III Implementing Sustainable Succession Management: The 'nuts and bolts' of succession management; Bibliography; Index. Andrew Munro (MA, C. Psychol) started his career with SHL, the psychometric testing consultants, then moved into financial services, where his responsibilities included executive development and succession planning. In 1993 he co-founded Andrew Munro Ltd, a consultancy specialising in leadership assessment and development and strategic resourcing. He is also a Director of Azure Consulting International Ltd whose focus is the link between long-term organisational success, succession management and leadership character.